The EPA, one of the most corrupt government agencies in the current administration (which is saying a lot), was solely responsible for a significant toxic waste spill in a Colorado river last week which affected the drinking water of thousands of residents. 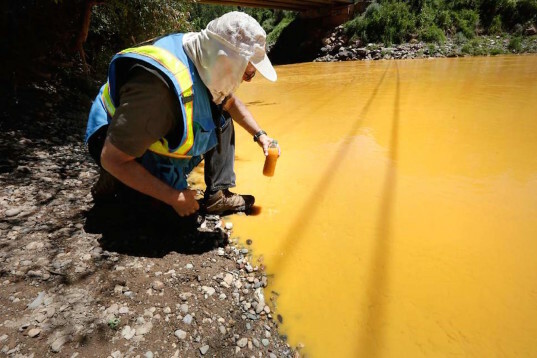 The spill was caused by an EPA crew poking around looking for signs of water contamination who accidentally breached a dam with heavy machinery in a stunning display of incompetence sending millions of gallons of lead, arsenic, and dangerous metals into the nearby Animas River. As we have seen from the IRS and VA scandals, government agencies never have to apologize for infractions and they certainly are never held accountable. It took the EPA six days to apologize and take responsibility for its wrongdoing but they have also chosen to ignore some very troubling reports that are now surfacing about why they were at this mine in the first place. Turns out, the owner of the mine is claiming that he was coerced by the EPA and threatened with a $35,000 daily fine if he didn’t agree to let them come in and ultimately ruin his business. Hennis said the EPA forced him to allow access to his mine four years ago. He did not want to give the EPA access to investigate the leakage from his mine but said he was fined daily. “When you’re a small guy and you’re having a $35,000-a-day fine accrue against you, you have to run up the white flag,” he said. This accusation is made more credible by the fact the EPA has done this kind of thing many many times. This is extortion, taxpayer funded extortion to be exact and unfortunately this kind of tactic is becoming extremely prevalent in this administration to the point where it really isn’t even a surprise anymore. I hate everything about what’s happened there. It’s sickening what the EPA can do and get away with, making the citizens pay for their screw ups in money and health. Dang EPA Nazis!! They’re so Left-Wing Liberals! !